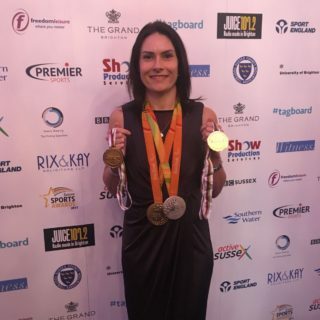 Katie-Georg Dunlevy was absolutely delighted to win the Disabled Sports Personality of the year in Sussex on Saturday Night – Then as the final awards were announced she was completely overwhelmed to discover that she had also won the Sports Personality of the year. Now in its 15th year and held at The Grand Hotel on Friday 17th November, the 2017 Sussex Sports Awards welcomed special guest and Invictus Games champion Mike Goody, along with regular host BBC Sussex presenter Danny Pike. Both were on hand to offer their congratulations to all winners on what has been another highly successful year for the county both at elite and grassroots levels. After securing gold and silver medals at the Rio Paralympic Games in 2016 on the tandem bike, Katie, who is registered as blind, wanted to add the World Title to her list of honours. So, from the moment she and her pilot returned from Rio, training began once more. She stuck to a gruelling training schedule which often included three hours on the training bike followed by hours at the gym, even over Christmas, through injury and illness. The World Championships took place in South Africa in September and Katie and her pilot competed in two races – the 31km individual time trial and the 85km road race. The pair won both races securing two more gold medals and the rainbow jersey awarded to the new world champions.